Eggplants have long been prized for their beauty as well as their unique taste and texture. The skin is glossy and deep purple in colour (the skin has been used in the making of dyes), while the flesh is cream-colored and spongy in consistency. Contained within the flesh are seeds arranged in a conical pattern. 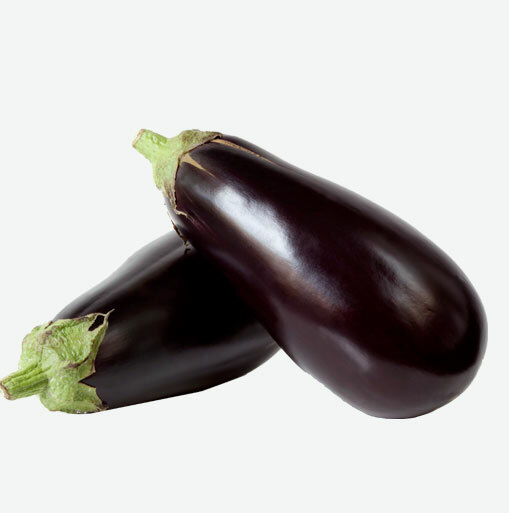 There are a number of readily available eggplant varieties, including Asian (or long) eggplant, the smaller baby (or Italian) eggplant, and the white eggplant (which looks like an egg). Although usually considered a vegetable, the eggplant is actually a fruit. It is a member of the nightshade family, which makes it a relative of the potato and the tomato. All these vegetables are considered good sources of vitamins and cancer-fighting phytochemicals. Eggplants are low in calories: just one-fifth of an eggplant contains 2 grams of fibre and 1 gram of protein, and only 25 calories. Eggplant skin also contains nasunin, a potent antioxidant and free radical scavenger that has been shown to protect cell membranes from damage. Choose eggplants that are firm and heavy for their size. Their skin should be smooth and shiny, and have a vivid colour. They should be free of discolouration, scars, and bruises—these can indicate that the flesh beneath has become damaged and possibly decayed. The stem and cap, on either end of the eggplant, should be bright green. To test for the ripeness of an eggplant, gently press the skin with the pad of your thumb. If it springs back, the eggplant is ripe; if an indentation remains, it is not. Although they look hardy, eggplants are actually very perishable and care should be taken in their storage. Eggplants are sensitive to both heat and cold and should ideally be stored at around 10ºC. Do not cut eggplant before you store it as it perishes quickly once its skin has been punctured or its inner flesh exposed. Place uncut and unwashed eggplant in a plastic bag and keep in the refrigerator crisper where it will keep for a few days. When cutting an eggplant, use a stainless steel knife (carbon steel will react with the phytochemicals and cause the eggplant to turn black). Wash the eggplant first and then cut off the ends. Most eggplants can be eaten either with or without their skin. To remove skin, you can peel it before cutting or if you are baking it, you can scoop out the flesh once it is cooked. To tenderize the flesh’s texture and reduce some of its naturally occurring bitter taste, you can sweat the eggplant by salting it. After cutting the eggplant into the desired size and shape, sprinkle it with salt and allow it to rest for about 30 minutes. Rinsing the eggplant after “sweating” will remove most of the salt.